There are a few kinds of 1.74 high index lenses that can be used for your high index glasses. What are they, and how do they differ? High index glasses have all sorts of options for high index lenses, from plastic to glass, 1.67 to 1.90 index, and all sorts of color and prescription options. If you’re looking to get the thinnest plastic lens high index glasses around, 1.74 is the way to go. 1.74 high index glasses come with a few different options for lenses. Single vision, lined bifocals, and progressive bifocals can all be purchased in 1.74 high index glasses, and the lens colors range from brown and gray tints for any prescription to polarized lenses for single vision or lined bifocals. These lenses are also available in a limited set of glasses styles. Wraparound high index 1.74 glasses are not possible because the lenses are not made large enough to be edged into a wraparound frame. 1.74 high index lenses are available in single vision, lined bifocal, and progressive bifocal prescription types. 1.74 high index glasses can be purchased with clear, brown tinted, gray tinted, polarized gray, and polarized brown lens colors. 1.74 high index lenses are not available in polarized lens colors with progressive prescription types. 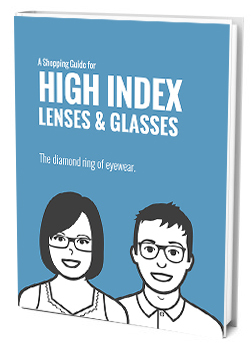 1.74 high index glasses are not available in wraparound glasses because the lens blanks are not large enough to be edged into the large lens pockets typical of wraparounds. 1.74 high index lenses are the lightest, thinnest lenses you can possibly get and can be made in the highest prescriptions. 1.74 high index glasses remove the distortion to your eyes that makes them look larger or smaller than they are, making your prescription look less strong and your face look more attractive and true to your natural proportions. If you have a very high prescription and want the thinnest lenses possible, 1.74 high index plastic lenses are the right choice for you. They have the thinnest profile and lightest weight of any high index plastic lens, and they are available in a variety of prescription types and lens colors. 1.74 high index glasses are the most popular high index glasses among people with the strongest prescriptions because of their light weight, scratch resistance, thinness, and attractiveness. As always, if you order high index glasses, make sure you order anti-reflective (AR) coating to reduce the glare cause by high index lenses. If you have any questions about high index glasses, leave us a comment below! We’d love to hear what you have to say. Thanks for reading, and happy shopping!